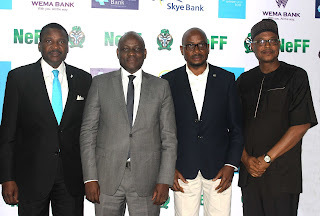 The Skye Bank Boss, who was represented by the Bank's Executive Director Technology & Services, Innocent Ike noted that “one of the strategies to deal with this menace was the enactment of the Cybercrimes Prohibition, Prevention Act, 2015 which is meant to regulate the cyber security space in the country and provide for the application of stiff penalties for internet infractions”. He then disclosed that "through a shared services initiative with key stakeholders across the e-payment channels, that will be domiciled with NeFF by first quarter 2018 through which incidence of electronic fraud would be curbed. He expressed joy that this was the “first time we are having representatives of Airtel, MTN, Glo and 9mobile join us at this quarterly forum to enable us work in unison and jointly explore and look at issues that would make the USSD mode of payment, threat free".